This informal lunch time session will explore the landscape of sexual orientation and gender identity in the academic work place. Why is it important to embrace it? And how we can all help to make the university a better working environment? Featuring an open Q&A discussion with LGBT+ staff & students and the Pride in STEM charitable trust. Supported by Professor Sarah Sharples, Pro-Vice-Chancellor for Equality, Diversity and Inclusion. 12.30-1.30pm, Wednesday 20 February 2019: LT4, Medical School, Queen’s Medical Centre, NG7 2UH. 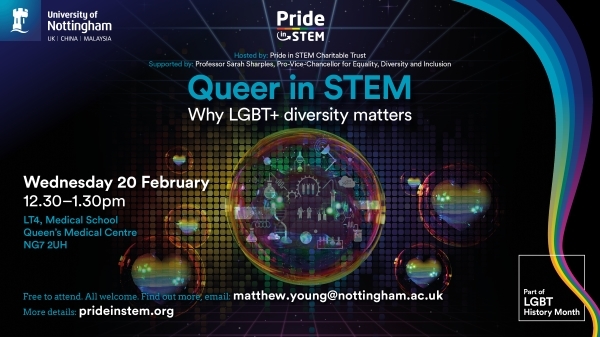 To find out more, email matthew.young@nottingham.ac.uk and visit prideinstem.org. Part of LGBT History Month.